2/08/2010: Yet another beer from the trade I had with Jared. We actually will be trading again here soon. I am sending him a Whiskey Barrel Aged Yeti, and he is sending an Imperial Stout Trooper in return. Apparently LucasArts is suing New England brewing over the name and likeness, super weak. You can read about it here. This is my first ESB in my journey. The name of the style is misleading because more often than not ESB’s are not bitter at all. The smell is tons of malt and brown sugar. The taste is heavy on toasty caramel malt, with some brown sugar, and I am picking up a bit of cinnamon. A little tiny bit of hop presence, and no pumpkin taste to be found. Mouthfeel is medium with a perfect amount of carbonation. 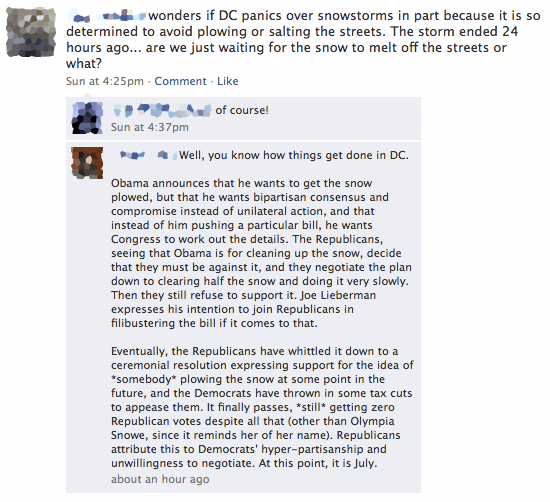 Funny Picture of the day: Genius explination of why DC never plows their streets. I experienced this first hand over the weekend.